MOSCOW, June 13. /TASS/. 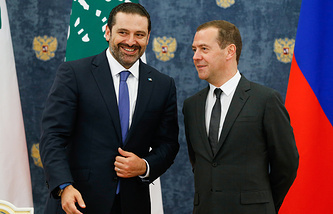 President Vladimir Putin is concerned about negative trends on declining trade turnover between Russia and Lebanon in early 2018, urging to expand the economic cooperation between the countries. President suggested that those issues and pressing regional problems be discussed. Lebanon’s PM said that the two countries "have a lot to work on in the future." "We plan to continue cooperation," he emphasized.